Tracy Lyster- Sprawl report-Mission needs a tree protection bylaw! Original artwork by: Ronnie Dean Harris, Corinne Devi (Corinne Donnelly), Rocky LaRock. Courtesy photos: Rick Skerry, Mike Stefiuk, Nick Lanfear, Andrew Wright c/o Watershed Watch Salmon society, Dr. Marvin Roseau, Sarah Doyle. Cover photo: Bald eagle in the winter by guest photographer Rick Skerry, Mission. Original artwork by: Carrielynn Victor, Leanne Hodges, and Peter Wayne Gong. Courtesy photos: Mike Stefiuk, South Coast Conservation Program, Dogwood BC, Nick Lanfear and Ian Stephen (WaterWealth). 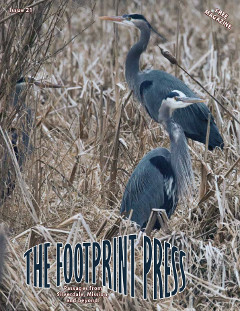 Cover photo: Great Blue Herons, Bruce Klassen. Contents: Rebecca McMurray- Hummingbirds in the winter? Tracy Lyster- Sprawl report: Who will protect the Stave river? Eddie Gardner- Operation virus hunter: Fish farm violations exposed! Michael Gildersleeve- Site C: Why should we care? Val Pack- Getting to know our local species at risk: Snowshoe hare. Original artwork by: Amber Silver, Peter Gong, Kathryn Shaw, Gary Haggquist, Carrielynn Victor, Kristi Bridgeman & Lisa Shepherd. Courtesy photos: Rick Skerry, Mike Stefiuk, Gary Haggquist, Gordon Mohs, Joe Foy, Mission Museum and ACT art gallery. 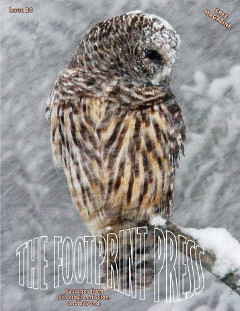 Cover photo: Barred owl in a snowstorm, Bruce Klassen, Silverdale. Contents: Yvette John- Old Growth Medicine. Val Pack- Townsend’s Big-eared bat. Carl R. Koehler- Why would anyone want to purchase a Bat House? Ann Murdoch- Did you know these terms for groups of animals? Tracy Lyster- Sprawl report: Mission’s Proposed new Official Community Plan. Ben West- The Race for Empowering Alternatives to Kinder Morgan. Original artwork by: Rocky LaRock and Claire Louise Stephen. Courtesy photos: Sarah Doyle, Jenn Barret (SCBat), Charlene Aleck, Dave Burroughs. 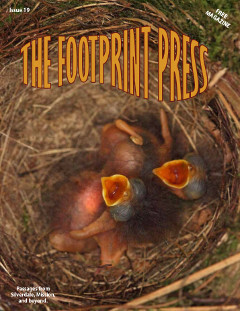 Cover photo- Swainson’s thrush nestlings, Bruce Klaassen, Silverdale. Dr. Jeff Mathews- A fish worth fighting for. Eddie Gardner- Stó:lõ, Salmon, and Cedar – A Sacred Relationship. Echo Lake’s Old-Growth Forest and Eagle Roost Under Threat! Val Pack- Getting to know our local Species at Risk- Meet Boomer! Kat Wahamaa- Stream- trading water for gravel. Original artwork by: Leanne Hodges, Carrielynn Victor, Kat Wahamaa and Peter Gong. Courtesy photos: Mike Stefiuk, Doug Ransome, and the South Coast Conservation Program. Many thanks to Gerry Powers and Pontus Lindgren. 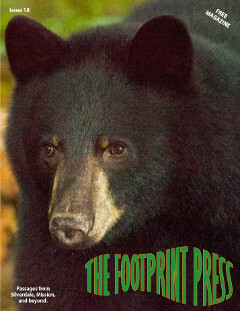 Cover photo- Black bear, Bruce Klaassen, Silverdale. Dr. Marvin Rosenau- Trouble on the Fraser River at Mission: In the water and on land. 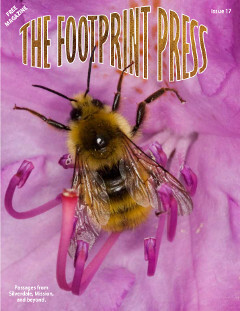 Val Pack- The latest buzz… Getting to know our local species at risk-Western Bumblebee. Lisa Shepherd- The maligned dandelion. Neil Smith- The zero-emissions cycle ride. Rei Joon- Organic is a human right. Tracy Lyster- Who will decide the fate of the Fraser river? Original artwork by: Lisa Shepherd, Peter Gong & Darrell Thorne. Courtesy photos: Mike Stefiuk, Rich Hatfield, Rei Joon. Cover photo- Bumblebee, Bruce Klaassen, Silverdale. 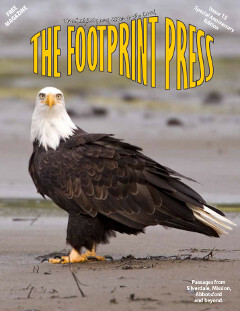 February 13, 2016 by admin 1 comment on "Footprint Press Issue 16: 2016"
Artwork by: Lek’ hoosh Leon & Rocky LaRock- Sts’ailes, Carrielynn Victor- Cheam Village, and Ellen Sereda. Courtesy photos: Mike Stefiuk, Marvin Salvail, Rick Skerry, South Coast Conservation program. 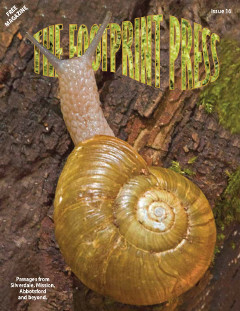 Cover photo- Lancetooth snail, Bruce Klassen, Silverdale. Kim Sutherland- The Land that Feeds us: the Value of Farmland in the Fraser Valley. Lynn Perrin/PIPE-UP Network- Concerns about the National Energy Board’s flawed review of Kinder Morgan’s Trans Mountain Pipeline expansion proposal. Matt McAllister- Wild Mushrooms in the Pacific Northwest. Eddie Gardner- Wild Salmon, Dying from Industrial harm, Climate change, and Politics. Ken Floris- Farming on the Fraser. Val Pack- Making Mountains out of Molehills. P. Charles Ransom- The Tale of the Townsend’s Mole. Elena Edwards- Ode to a Mighty River. Artwork by: Brandon Gabriel- Kwantlen First Nation, Cody Lecoy, Roxanne Charles, Gary Haggquist, Don Mair, and Peter Gong. Courtesy photos: Kim Sutherland, Hancock Wildlife Foundation. Cover photo- Eagle and Salmon, Bruce Klassen, Silverdale. Tracy Lyster- Creating a new vision for the Silverdale lands in Mission B.C. 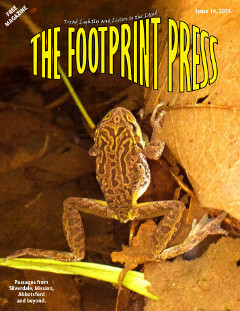 Bruce Klassen- Cover photo: Pacific Tree frog, Silverdale. 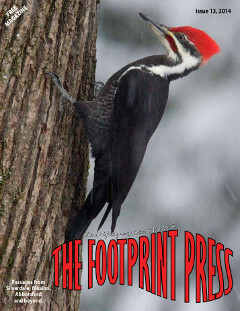 Copyright © 2019 The Footprint Press. Powered by WordPress and Themelia.